We've always had a soft spot for Altec Lansing's wide array of speaker docks -- these guys have been embedded in that space for an awfully long time, and the quality has always seemed up to snuff in our eyes. Er, ears. For whatever reason, it looks as if Altec is trying to replicate that success in the earbud market -- a market that's been growing increasingly crowded over the past couple of years as the portable media player and smartphone sectors have exploded. These days, a set of third-party headphones are nearly a requirement to fully enjoy whatever media player you've ended up with, and thus, hordes of companies have flocked to cater to the demand. The Ultra MZX606 earbuds ($99.95) popped onto the scene just two months ago, and now we've had a solid weekend to push the latest Underoath, Happy Body Slow Brain, Kanye West and Otis Redding jams through here. Hop on past the break for our impressions. Design wise, these are about what you'd expect for a $100 set of 'buds. The glossed cable is tough to tangle, the input jack is solid and thick, the remote is rugged enough and the earbuds themselves are downright classy. We haven't exactly seen a design like this before, and while it's eye-catching at a glance, we get the impression that Altec's designers were going for more than aesthetics. The more chances you give users to bend or break a cable, the worse, so this bracing system actually helps to prevent unnecessary bends when they're inevitably shoved into the bundled carry case. They're also delightfully lightweight, but strangely large. 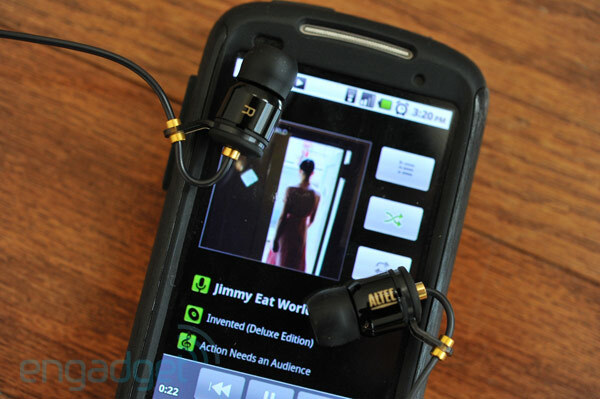 The casings themselves feel bloated by modern day earbud standards, and the included earbud tips are no different. Altec threw in four sets of tips with our review unit; a small / medium / large trifecta of the typical "round" tips, and a single, one-size-fits-all dual-flange set. But here's the thing: even the small tips are enormous. We can't even imagine a human outside of The Undertaker or Shaquille O'Neal who could realistically use the large ones. In the past, we've tended to prefer the dual-flange tips when given the choice, and while the seal was certainly superior with those, they were still too large for us. We're thinking a smaller set of dual-flange tips would've hit the sweet spot for us, but alas, those aren't included. Or even created, so far as we know. Unfortunately for Altec Lansing, the eartips make all the difference in the world when it comes to audio quality and overall enjoyment / dissatisfaction. We tested out all of the tips, and while the dual-flange ones did actually maintain a relatively good seal even while exercising, the sound quality was underwhelming through all of them. We tested out a variety of genres -- from jazz to metal and just about everything in between -- and two things made themselves apparent throughout. First, there's a distinct lack of low-end. Even from a non-basshead's perspective, the low lows just weren't in attendance like they should be. Secondly, the mids and highs were pretty impressive, and quite accurate even when pressed at higher volumes. Sadly, two out of three doesn't cut it these days, and even though the highs and mids were on-point, they still lacked a certain enthusiasm that was evident in Sleek Audio's $79 SA1 and Klipsch's $99 Image S4i. 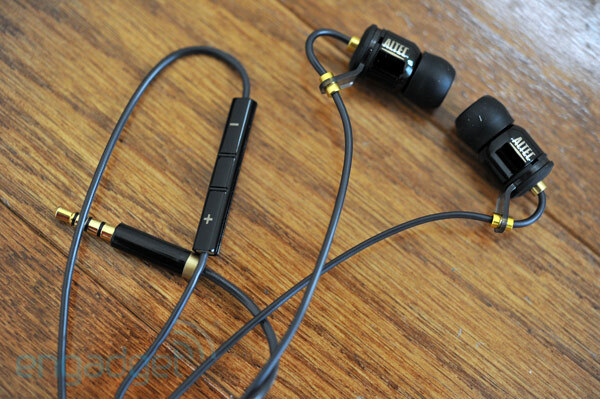 Here's the thing: the Muzx Ultra MZX606 earbuds cost $100. That's a bold price point, and considering the intense competition in that range, there's simply no room whatsoever for a let down in any aspect of the product. The aforesaid SA1 from Sleek Audio and Klipsch Image S4i (which includes an three-button iPhone remote, to boot) both outperform these guys handily, from overall design to overall audio quality. For some strange reason, Altec decided it best to stuff the inline remote about an inch from your cheek rather than at the yoke below your chin -- we're guessing they wanted the microphone closer to your lips, but you're left with a ridiculous stick slapping you in the face with every single step on the treadmill. Not cool. Furthermore, it's hard to endure any eartip once you've had the pleasure of inserting Klipsch's oval tips into your flappers. Canal openings simply aren't round; they're oval, and oval tips undoubtedly provide a more premium seal, and in turn, a better audio experience. If Altec Lansing were to price these at half of what they are, they'd be tough to overlook. But at $100, given the competition, they're frankly hard to even consider.